You don't like collecting monsters? 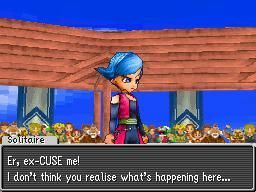 Dragon Quest has really found a new home on the DS. DQ IXsurprised us all by moving onto a handheld system, and last year's Rocket Slime paved the way for it. Now Dragon Quest Monsters: Joker is the third reason for RPG fans to get a DS (Ok, chronologically it's the second reason). The game takes the monster battles, which first appeared way the heck back in DQ V, expands them, adds some Pokemon related gameplay elements and creates a fun game that steals all our free time. You'll travel around several islands in the Green Bay, collect and battle monsters from the Dragon Quest world, breed them to create more powerful monsters and attempt to win the Monster Scout Challenge. Yes, it sounds like Pokemon, but remember Dragon Quest has a long history of monster battling of its own. It's tough to say where DQ ideas end and Pokemon begins. To be honest, we don't really care because the game is every bit as addicting as smaller-scale monster battles in DQ VIII and now it's been expanded into a full-sized game. You start with a weak monster and begin by fighting other monsters to power-up. Along with fighting, you can scout other monsters to entice them to join your team. The chances of successfully scouting depend on the attack power of your monster team. If your guys are strong enough, the prospective teammate will have a good chance of being super-impressed by your awesome fighting skills and join up.If you aren't strong enoughthe monster will probably just get pissed-off. It turns out that the hallway-blocking green dragon we were fighting didn't really want to team up with a dinky Mischievous Mole until we had leveled him up and transformed him into a Hammer Hood - he's muchcooler than a mole. As your creatures gain levels they accumulate skill points which can be assigned to skill sets.The sets you put points intodetermine whatspells, attribute bonuses and abilitiesyour little dudes will learn. You won't win the Monster Scout Challenge without careful planning where to place each skill point you earn. Oh, and you'll also need to collect your own army of creatures. Before long you'll have your own team of three monsters and three more that you can swap in if one of your guys needs to come out - for example,he could be dead.After exploring a few of the islands you'll collect enough monsters to startyour ownpetting zoo, butmost of your horde will have to wait in storage until you decide to do something with them. That's where the fun part of monster management comes in; to get the best monsters you'll need to find a positively charged monster and a negatively charged monster and put them together to "synthesize." Boom chicka bow-wow. The Series creator, Yuji Horii,told us the game is going for an audience a bit older than most Pokemon players, so we figure it's ok that the game talks so openly about how synthesis works. Incidentally, the process also destroys your first two monsters, but their traits can be passed down to your new creation. Managing your creatures, powering them up, winning the big tournament and collecting 'em all takes a lot of time, but we like searching every corner of every island because we like being the best. That's us though.If you hate backtracking, looking for hidden things and having to spend some serious time building and rebuilding your elite fighting team of cute little critters, you may want to look elsewhere for fun. Description Joker takes Dragon Quest Monsters to a whole new level of obsession for people who are too cool to be seen playing Pokemon.